A new kitchen is a big investment into your home. A good kitchen should last you many years but there will come a time when you need to upgrade, replace or redesign it. Of course, the right time for a new kitchen depends on a range of factors including the quality of the original build, the wear and tear over the years, changes in your requirements and evolving personal tastes. At Price Kitchens, we have extensive knowledge of advising customers looking for kitchens in Crawley, Croydon, Clapham and beyond. Our advice is to look out for these 4 warning signs to help you decide whether it’s time for a kitchen rethink. The most obvious element of your kitchen is the fitted units and the worktop. If the colour has faded, the laminate is peeling or the whole thing looks more than a tad outdated, it’s time for an upgrade. While you can stem the tide of time by quickly and cheaply replacing the worktop or the cabinet doors, you probably know deep down that it won’t be long before a brand new kitchen is on the cards. Your kitchen should serve the needs of your household – but what if these have changed? 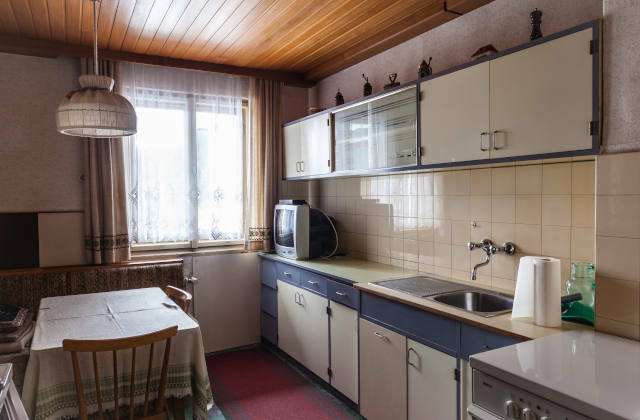 From a growing family to the nest becoming empty, a new found love of cooking or a new pet in the house, these and many other changes can all influence the kind of space and facilities you need in the kitchen. If your old kitchen is no longer fit for purpose, speak to a kitchen designer about how best to redesign. All standard kitchen appliances such as an oven, hob or fridge have a lifespan, after which it’s time to replace them. How many years’ enjoyment you will get out of each appliance depends on the build quality and subsequent care – you may be lucky. But if annoying faults have developed or the device has stopped working altogether, it may be better to buy new rather than to repair an ailing machine. New kitchens are amazing to look at and exciting to use; old kitchens much less so. If you no longer feel proud to show off your kitchen, however sparkling you may have kept it, or the space is simply no longer inspiring or even pleasurable to spend time in, maybe it’s time to look around for new ideas. At Price Kitchens, we know we can help. Our extensive kitchen collections have something for every taste and budget, and whether you’re redesigning your kitchen in Haywards Heath, Reigate or Wimbledon, it all starts with a visit to our Croydon showroom for a look at our displays. Why not have a chat with one of our friendly, professional team, obtain useful information and advice and talk through all the options available? Call today on 020 8686 9006 or message us here.